Art Spectrum Medium No. 1 is ready to use straight from the container and is the leanest of the Art Spectrum mediums. Depending on climate and thickness of the paint, Medium No. 1 will usually dry overnight. It contains a balanced amount of stand oil and turpentine for a well balanced and permanent paint layer. Use to clean and lessen absorbency of pre-primed canvas, simply wipe on and then wipe off. Art Spectrum Oil Painting Medium No. 2 is used as the next fattest medium in the sequence of painting by the"fat over lean" rule. It contains more oil and slower drying than Medium No. 1. Medium No. 1 can be fattened by gradually adding Medium No. 2. Medium No. 2 may be used as a glazing medium but if very thin veils of colour are required, it is recommended to use Art Spectrum Medium No. 4. Art Spectrum Oil Painting Medium No. 3 is used as the fattest medium in the sequence of painting by the"fat over lean" rule. It contains more oil and slower drying than Medium No. 2. Ideal for painters who prefer a heavier and more viscous medium. Medium No. 2 can be fattened by gradually adding Medium No. 3 10% increments. 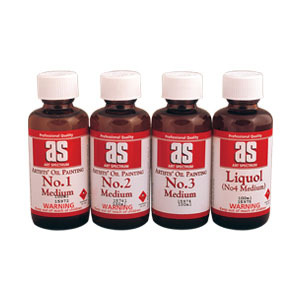 Art Spectrum Oil Painting Medium 4, or Liquol medium is a glazing medium. Fast drying and versitile medium ideal for multiple glazes. Depending on climate and thickness of the paint, paint mixed with Medium 4 will dry within 24 hours. Paint wet on wet or leave to dry before overpainting.